75-year-old Stephen Doiron is UH's oldest graduate for Spring 2018. For many people, retirement means spending more time with family, traveling around the world or picking up new hobbies. 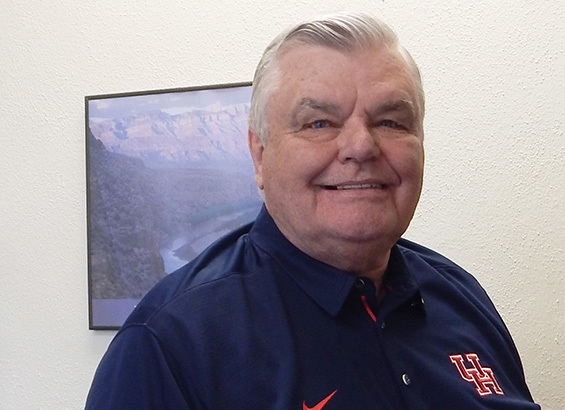 For Stephen Doiron, his golden years have been spent immersed in books at the University of Houston. In just a few days, the 75-year-old (he turns 76 on May 19) will receive a Master of Arts in English. He will also be the oldest person to graduate from UH this spring. Doiron was runner-up to that title in 2014 when, at 71, he received a Bachelor of Arts in English with a concentration in literature and a minor in film studies. Armed with two degrees from UH and a lifetime of experience, the former journalist and surveillance control specialist in the U.S. Air Force has found a new purpose. He has become an advocate for fellow senior citizens to pursue higher education. After all, he’s living proof that anyone - at any age- can get a degree. “I am considered a scholar. That doesn’t come easy, but when it does come to you, it’s one of the most joyful gifts you’ve ever had in your life,” said Doiron. During University Commencement, May 10-12, don’t expect to see Doiron cross the stage. He’ll be at home either reading one of his many books from the library or plotting his next move. He’s designing a graduate program for senior citizens, one that would be taught in the community, such as at the YMCA or at a church. He predicts it will take at least a year to finalize his proposal.